Can a rich dessert be considered Good Food? It can when it is Eli’s Cheesecake and its owner, Marc Schulman, is a strong supporter of the Good Food movement and makes the effort to source from local producers when it is possible to do so. 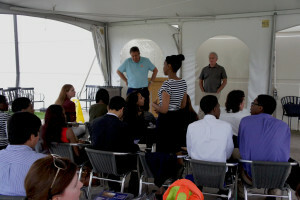 Eli’s Cheesecake President Marc Schulman (standing, left) and FamilyFarmed President Jim Slama watch as students from the Chicago High School for Agricultural Sciences introduced themselves at a June 25 event. Schulman has been running the company since 1988, following the death of his father, Eli Schulman, whose cheesecake — created for his restaurant Eli’s The Place for Steaks — has long been a Chicago institution. And for more than a decade, Marc Schulman has used his position as president to connect Eli’s Cheesecake with the rising Good Food movement, and has continued to innovate to integrate its values into his products. Among his civic activities, Schulman is co-chairman of the business advisory board of the Chicago High School for Agricultural Sciences, and purchases honey from beehives maintained there in his products, including specialty items such as Eli’s Wildflower Honey Cheesecake and Honey Mediterranean Cheesecake. Located on the city’s South Side, the high school is one of a handful of urban secondary education institutions in the nation focused on agricultural production and food business. Schulman also has a close association with FamilyFarmed, a nonprofit organization that promotes the Good Food movement and works to stimulate entrepreneurship and business development in the sector (and publishes the Good Food on Every Table website). Schulman, for example, served as a co-chairman of FamilyFarmed’s Good Food Financing & Innovation Conference, which kicks off the three-day Good Food Festival & Conference held each March in Chicago. He also was a mentor in the organization’s Good Food Business Accelerator — based at 1871, Chicago’s center for business innovation and incubation — which launched last fall and provided its first cohort of nine entrepreneurial businesses with a six-month program of instruction, mentorship, technical assistance, and networking opportunities. And Eli’s vegan cheesecakes are made with tofu produced by Chicago’s Phoenix Bean, whose owner Jenny Yang was a Fellow in the Accelerator program. So it was no coincidence that Schulman brought his Good Food interests together on June 25 by inviting Jim Slama, president and founder of FamilyFarmed, as the first of four guest speakers at the weekly summer farmers’ market at Eli’s Cheesecake headquarters in northwest Chicago. Nor that his audience was made up largely of students and teachers from the Chicago High School of Agriculture Sciences. 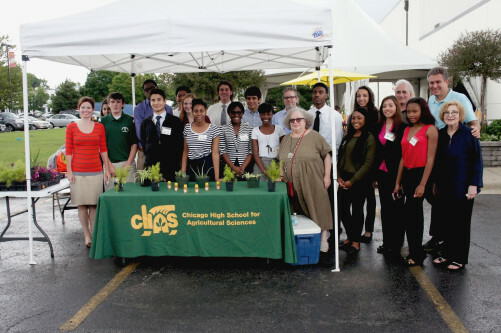 Students and instructors from the Chicago High School for Agricultural Sciences pose on June 25 at the school’s booth at the weekly farmers market held at Eli’s Cheesecake’s headquarters in Chicago. Eli’s President Marc Schulman is at the far right in the back row, with FamilyFarmed President Jim Slama directly next to him. Slama then engaged the students and their instructors with an overview of the benefits of locally and sustainably produced food. These benefits nclude food that is fresher, more nutritious, and tastier than that shipped in from distant places, and reduced use of agricultural chemicals and transportation, which benefits the environment and conservation. Most of Slama’s talk, though, focused on FamilyFarmed’s trademark issue, the economic benefits of Good Food, which also is of key interests to students who will be joining the workforce and looking for jobs before long. FamilyFarmed President Jim Slama discusses the benefits of Good Food in a talk to students and instructors from the Chicago High School for Agricultural Sciences at the weekly farmers market at the Chicago headquarters of Eli’s Cheesecake. Slama pointed out that while Illinois is one of the most heavily farmed states in the nation, it produces only about 5 percent of the food that its residents consume, with most of its farmland growing corn and soybeans that are converted to animal feed or biofuels. He noted that if that figure could be raised from 5 percent to 25 percent, it would generate $10 billion in new local and regional food sales. And he added that there is a multiplier effect when local dollars are used to purchase local goods and continue to circulate in the community — raising the potential gains for economic development to around $25 billion. Slama concluded by highlighting FamilyFarmed’s efforts to assist Chicago Public Schools in its “farm to school” programs that have brought Amish-raised, antibiotic-free chickens from Indiana and Michigan apples into its students’ cafeteria, and its entrepreneurial development efforts that evolved into the Good Food Festival & Conference and the Good Food Business Accelerator. The speakers series continues this Thursday (July 2) with a friend of FamilyFarmed: recent Accelerator Fellow Jenny Yang. Her Phoenix Bean is a fast-growing company on Chicago’s North Side that produces plain tofu, tofu salads, and other products from sustainably produced, llinois-grown soybeans. • Thursday, July 9: Tyler Strom and Leland Strom, directors of the Farm Credit System Insurance Corporation. • Thursday, July 16: Terra Brockman, founder of The Land Connection, a Champaign, Illinois, based educational nonprofit dedicated to preserving farmland, training new farmers and connecting consumers with local producers, and connecting consumers with local producers, and author of the well-regarded book, Seasons on Henry’s Farm. 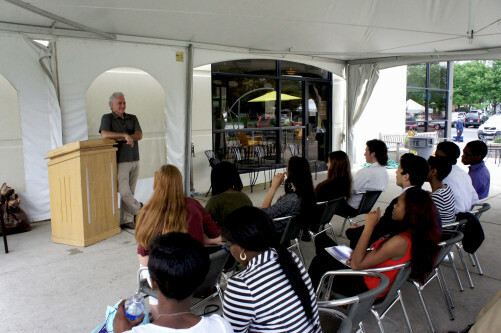 The speakers’ talks are scheduled to begin at 1 p.m. Eli’s stages the farmers market, which will continue on until Sept. 24, in partnership with adjacent Wright College, part of the City Colleges of Chicago system. It is located in the company’s parking lot at 6701 W. Forest Preserve Drive at Montrose Ave. in Chicago. A calendar of all of the company’s event can be found by clicking here. This entry was posted in Farm to school movement, Farmer training, Food education, Food Entrepreneurs, Good Food business development, Good Food Festivals, Good Food Financing Fair, Good Food marketing, Good Food Success Stories, School food, Sustainable food education and tagged Chicago High School for Agricultural Sciences, Eli's Cheesecake, FamilyFarmed, Food education, Good Food, Good Food Business Accelerator, Good Food business development, Good Food education, Good Food Festival & Conference, Good Food Financing and Innovation Conference, Good Food movement, Marc Schulman. Bookmark the permalink.